No matter how niche or ridiculous some of his film pitches, fan-boy favorite auteur Guillermo del Toro continues to make some of the most imaginative films in Hollywood. After venturing off into the likes of the superhero genre with Hellboy and the definitive giant fighting robot experience with Pacific Rim, he’s returned to twisted roots of horror. 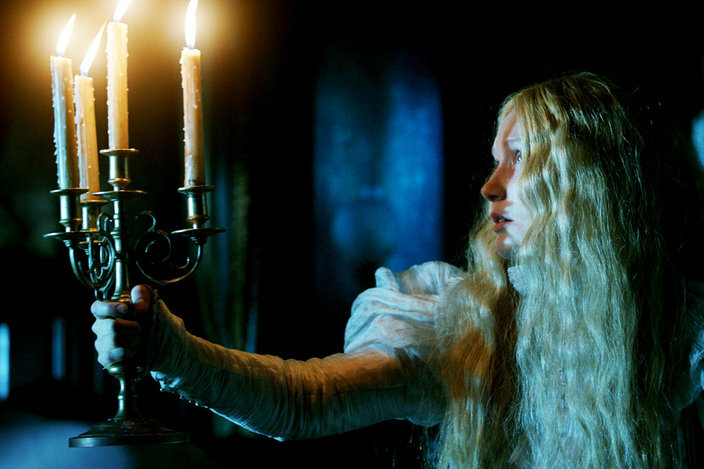 Crimson Peak presents us an entirely different type of haunted house film thanks to an uneasy victorian era setting. It’s got all the makings of a modern classic, but does Del Toro’s more methodical approach to storytelling stand a chance in an era of fast paced horror? Crimson Peak takes us back to the late 19th century in the era of Edgar Allen Poe, Mary Shelly, and other gothic novelists to follow a young girl named Edith(Mia Wasikowska) who is haunted by ghosts from her troubled past. After years of working to become a writer, Edith encounters a mysterious inventor named Thomas Sharpe(Tom Hiddleston) who sweeps her off her feet and promises a life of love. After tragedy strikes Edith’s family, she decides to marry Thomas and move to his home in England along with his disgruntled sister Lucille(Jessica Chastain). It’s not long after moving into the ominously decaying home when she discovers she’s being haunted by ghosts. The film’s plot may sound all too familiar for readers of gothic literature, but Del Toro doesn’t fail to use his magic touch to bring a unique experience. His expertise arrives with an extra layer added to his characters thanks to hidden motives, secret relationships, and a look at the darker human nature that brings flavor to the film’s classic mystery story. The ambiguity of the characters is only elevated thanks to exceptional performances from all three leads. Jessica Chastain emerges from her “tough as nails” schtick to deliver something far more diabolical as she plays an troubled loner whose anger is lies just below the surface of her hyper-controlled composure. While her role is never entirely dubious, it’s Hiddleston’s outstanding muted performance that really keeps the film on edge. Mia Wasikowska sells the tragic story of Edith by bringing a warmth and sadness to the woman whose modest ambitions are consistently snatched away. Each of these leads take these already well crafted characters and brings an extra dimension to a trio of notably disturbed people. The supporting cast is also notable thanks to a slew of underrated character actors including Jim Beaver, Charlie Hunnam, Burn Gorman, and Del Toro regular Doug Jones(if you can catch his impressively understated handywork). The writing and acting really take this genre up a knotch, but the real star of this film is Del Toro’s impeccable eye for detail. Every single frame of this movie down to the smallest ant is a visual feast. The practical sets are refined to perfection to create a pure sense of dread that weighs in heavier and heavier with each passing minute of the film. Like Poe’s The Fall of the House of Usher, much of the terror created in Crimson Peak derives from the looming sense of doom and hopelessness filling each and every beat of the story. The house is a visual representation of the greater themes decay of aristocratic greed and the heart of darkness that lies below even the finest of people. The further into the mystery the story proceeds, the deeper the house sinks into its blood stained clay that oozes through the walls of the aging residence. Whether it’s set design or the ghost animations, Guillermo Del Toro continues to prove himself as a master of visceral horror. In in era where most ghost stories are made to hit a scream per minute quota, Crimson Peak‘s slow burn approach delivers a more haunting experience by wrestling with the meatier questions of human nature while also packing in a handful of grade-A scares. This movie never feels like a product of the Hollywood machine, but rather triumphs as a tribute to the works of Mary Shelly, Lord Byron, and a slew of other gothic authors. If the movie has one vice, it’s that the story here is relatively predicable and paint by the numbers for fans of the classic literature. The premise featuring a creepy decaying house with residents who are more than meets the eye has never been so edgy, but the reveal of the mystery has also never been less shocking. This film is undoubtably a labor of love for Del Toro which can be problematic when the story adheres pretty strictly to all the rules of the genre. It never looks to push the envelope or revolutionize the rules we know as much as it seeks to recreate the same old song and dance we’ve seen before in the most glorious fashion imaginable. Crimson Peak may only boil down to being the greatest homage Gothic literature has ever seen, but somehow what’s old feels fresh again. The masterful art direction, outstanding acting, and near airtight script come together to deliver an atmosphere and brand of storytelling we rarely get to see on the big screen which makes this a must see. Despite being a piece of relatively niche genre, the high production spook factor makes this the perfect pick for audiences looking to get in the Halloween spirit.